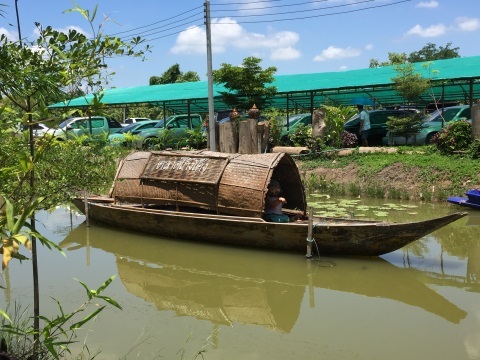 This month we feature our visit a very different kind of market in Bang Pa-In, a district in Ayutthaya, one that is really off the beaten track. 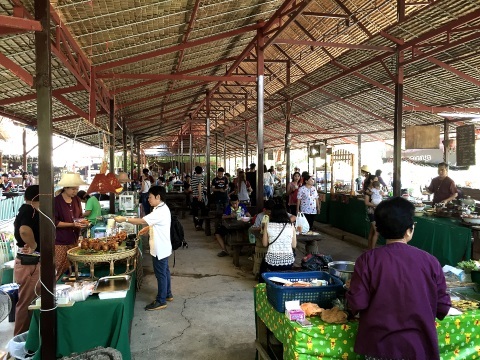 The Gong Khong Market is a quaint country market about 7 km north of Bang Pa-In on the road to Ayutthaya. 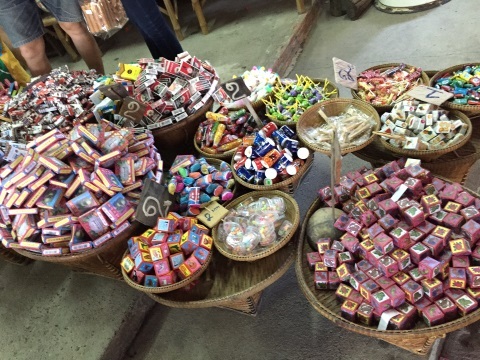 It’s a non-touristy and very localised place with lots of interesting items to browse through. 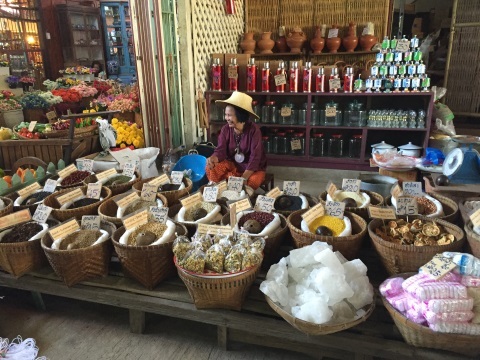 The market was built in a traditional setting to look like the markets of old. 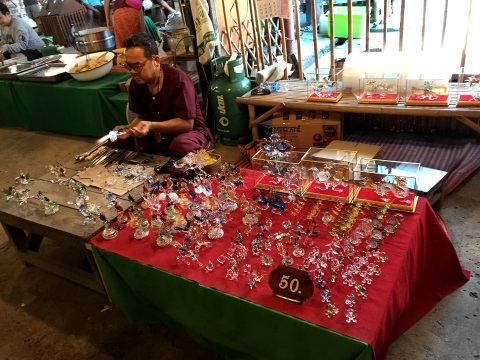 The name gong khong means to bend low, this is because most of the vendors place their wares almost at knee level and customers have to bend to take a closer look at the items. 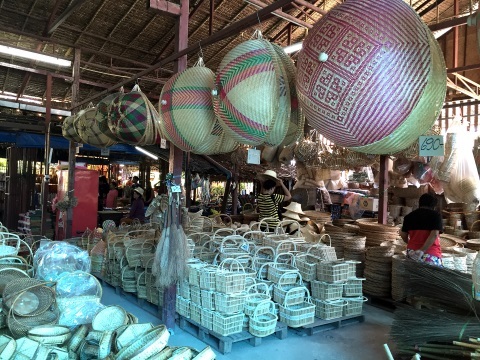 The products available in the Gong Khong Market include fresh vegetables, fruits, cooked food and desserts, basketry, household items, souvenirs, clay pottery, plants, toys and many others at very reasonable prices. 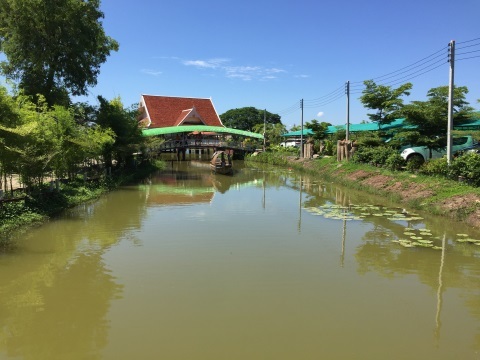 The market is located in a country environment with traditional Thai houses and an elongated pond that looks like a canal. 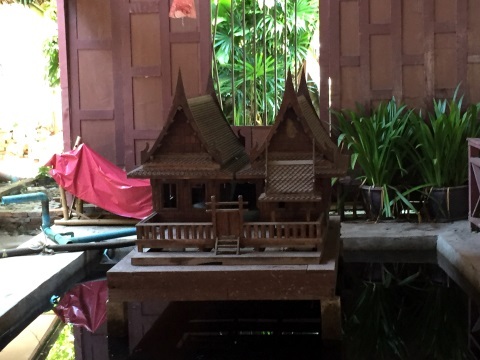 Homestay facilities with a country atmosphere are also available within the grounds of the Gong Khong Market. 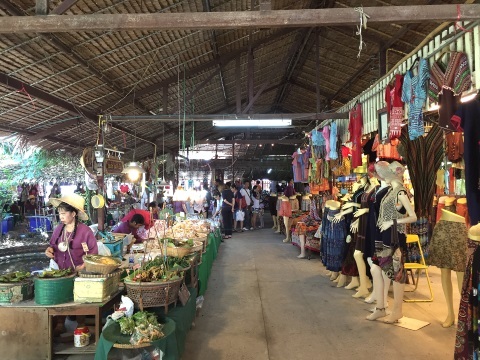 Let us take a tour this market and admire some of the attractive items available. 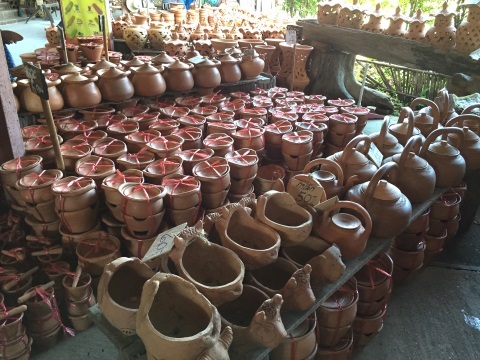 Besides vegetables, plants and fruits, the Gong Khong Market is noted for its clay pottery and there is a wide range of this pottery for use at home or in restaurants. 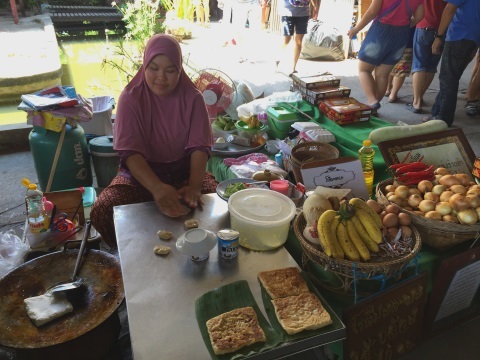 There are all sorts of different food, beverages and snacks in this market, some of which are very tempting. 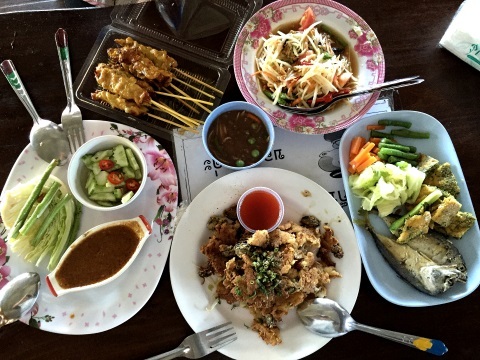 The cooked food section has a good spread of Thai food and that’s where we headed for after the initial tour. Of course, all this walking to view so much food is hungry work, so it was time to tuck into a good lunch. Some elaboration on the food is necessary; clockwise from top right, som tam (papaya salad), mackerel and salad with nam prik (chilli sauce with prawn paste), oysters fried in batter and lastly pork satay. 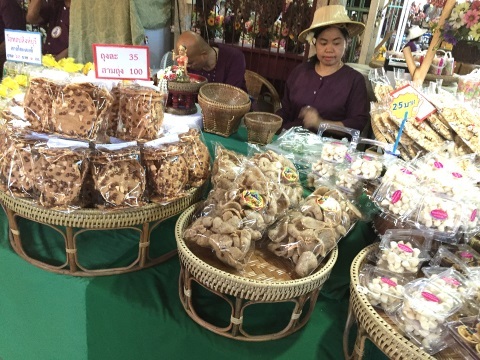 There’s more food in another part of the Gong Khong Market and this section has some very interesting varieties of food. 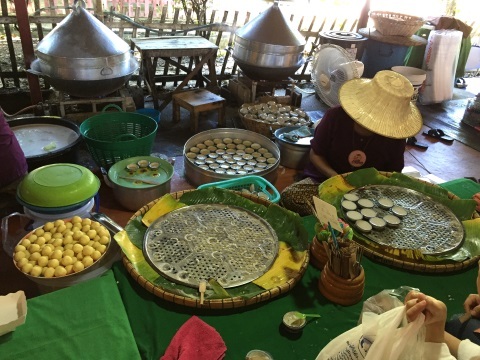 The containers on the left contain deep fried shredded pork, onions and garlic which is taken with rice, it’s called khao chae. 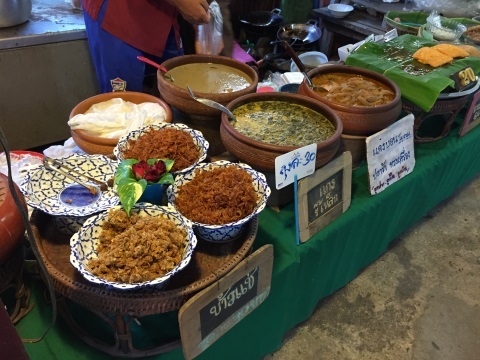 The other pots contain vegetarian stews, kaeng ki lek and kaeng bon. 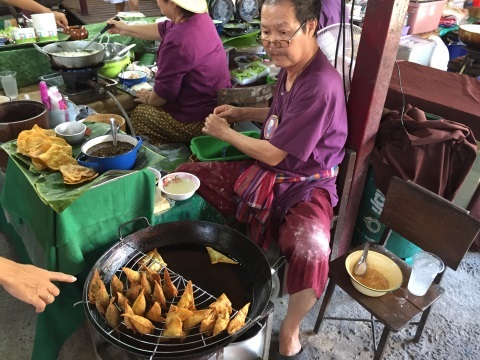 The next food item of interest is yew kwei a vegetarian snack of Chinese origin made from a filling of cabbage and mushrooms wrapped in dough and deep fried. 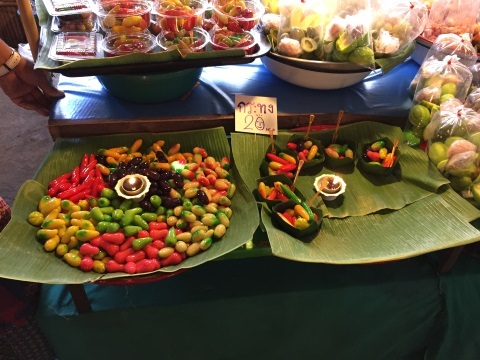 Vegetarian food is served during the Buddhist Lent for those who wish to refrain from eating meat. 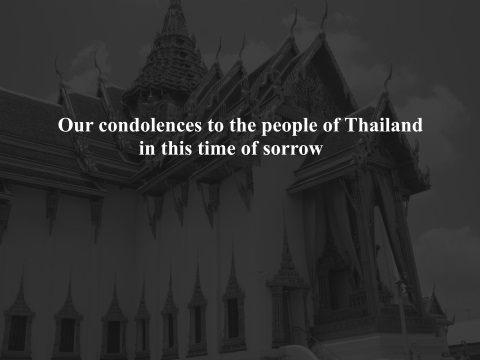 The Buddhist Lent is according to the Lunar calendar and for 2016, it was from 20 July - 16 October. And for a change in menu, how about some roti mataba, a flatbread of Indian origin that’s popular in South-East Asia. The filling for this bread consists of onions, garlic, chicken or beef or mutton. 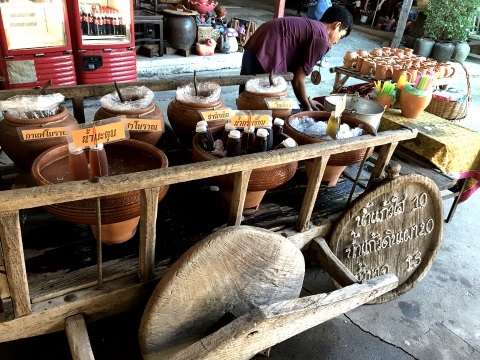 After all that food, to quench your thirst, try the refreshing drinks from this cart which includes traditional Thai coffee and some home-made juices like nam ma tum (left) juice of the fruit called quince or bael and nam kra jiab (centre), a drink made from boiling the petals of the hibiscus flower. 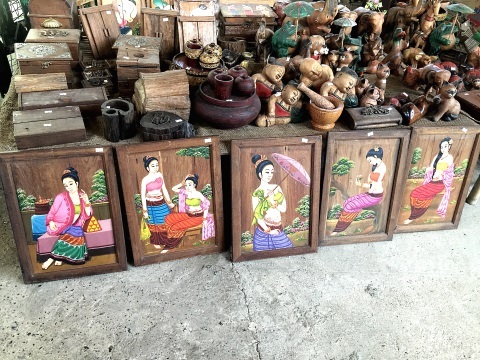 The art and handicraft products here are just as fascinating and there are lots of useful appliances or decorative pieces for the home. And before we go, let’s have a parting snack and these are really special. 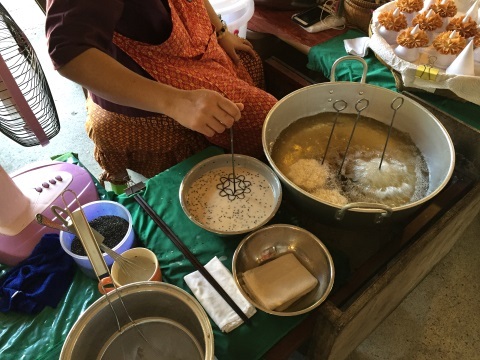 A delicacy like “kanom dork jork” is just too pretty to eat. The finished product is placed on inverted cones as shown in the top right hand corner of the first photo. It’s made by dipping the mould into the dough mixture (left of frying pan) then placed in the boiling oil. When the dough hardens, it falls away from the mould, it’s picked up with a pair of long chopsticks and placed on the inverted cones to cool down. This snack, called “luk chub” , looks very attractive and is extremely delicious. The coating is made from a powder called “wun” that’s mixed with water to create a sticky and malleable dough. The filling is made from grounded green beans. 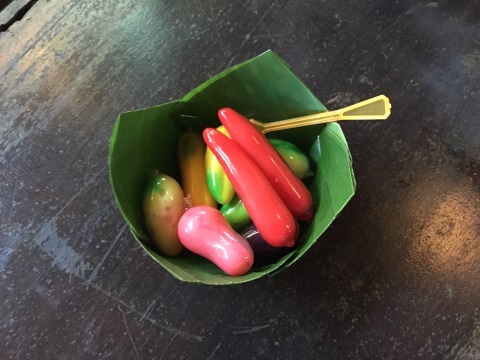 The coating and filing are then moulded into the desired shapes to look like chillies, cherries, beans. 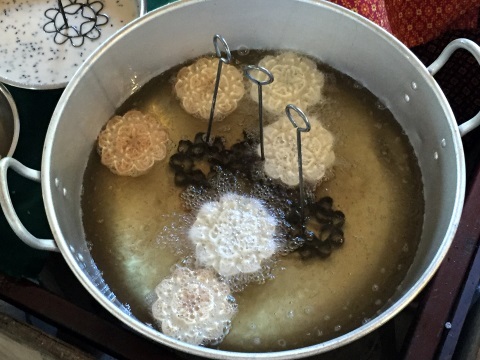 Dyes from natural material are used for the colouring. Try some the next time you have a chance. 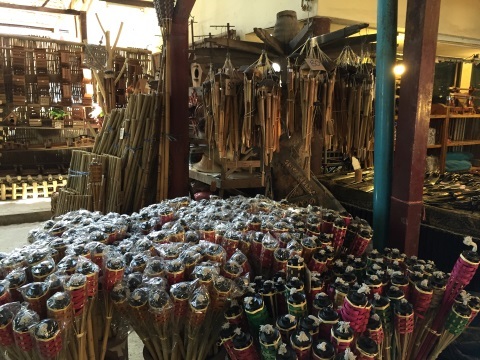 We haven’t even covered everything in the Gong Khong Market. 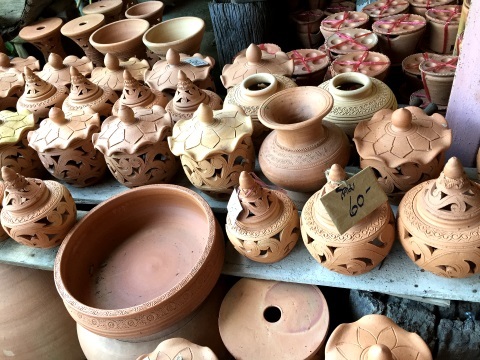 That was just a sample of what’s in store which is why a visit here makes such a wonderful weekend outing and a marvellous shopping experience. 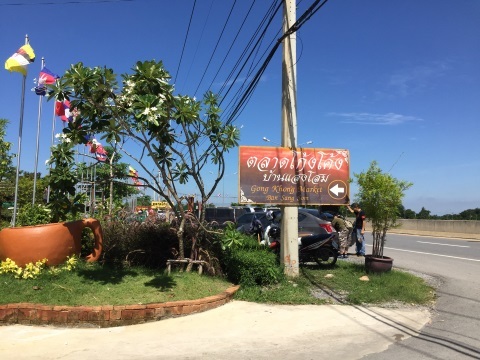 From Bangkok get on the Don Muang Tollway (Highway 1) – Highway 308 to Bang Pa-In – Highway 3477 to get to the Gong Khong Market, a distance of about 7 km from Bang Pa-In. 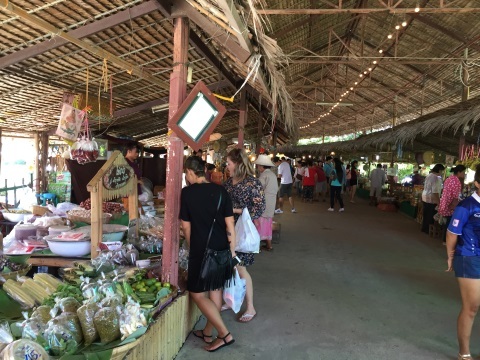 If you are coming from Ayutthaya, get on Highway 3477 that leads south of the city, go under the highway bridge at the junction with Highway 356, continue along Highway 3477 till you get to the Gong Khong Market. 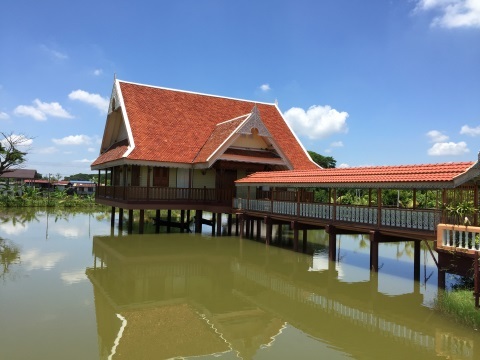 It about 10 km from Ayutthaya.